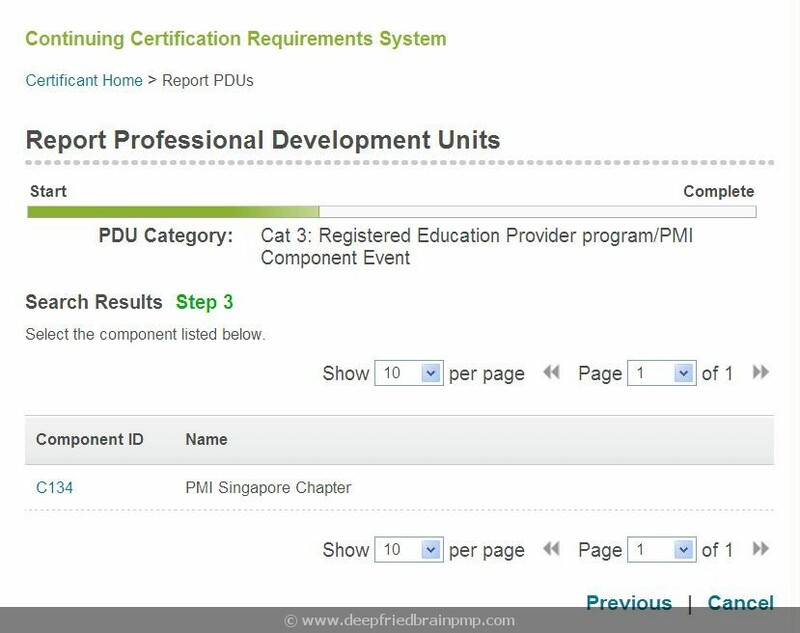 PMP Renewal: How to Report PDUs to PMI? 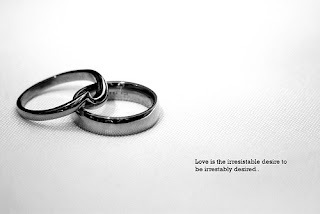 PMP Certification is like a marriage. 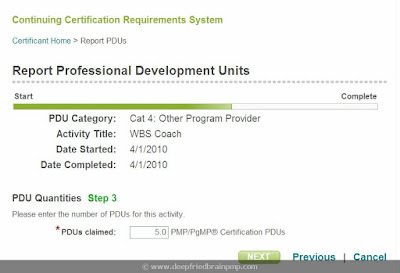 As with a marriage, PMP Certification requires commitment. 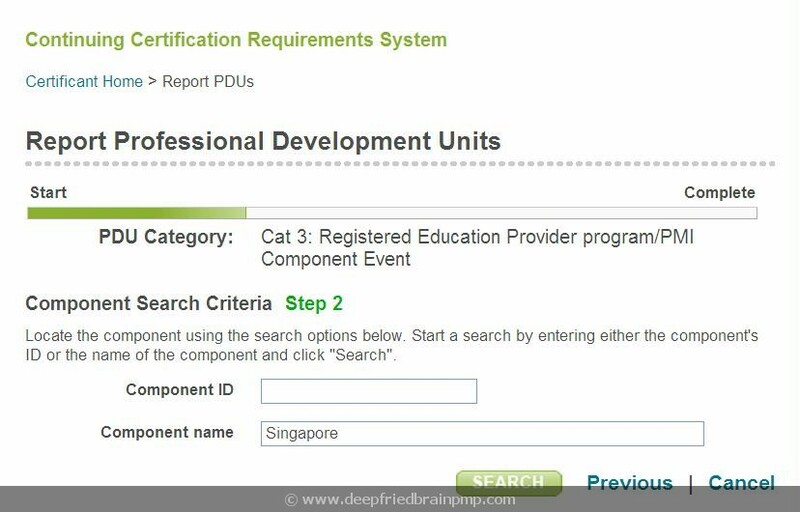 A commitment to get 60 Professional Development Units (PDUs) every three (3) years for the rest of your professional life, to retain your certification. 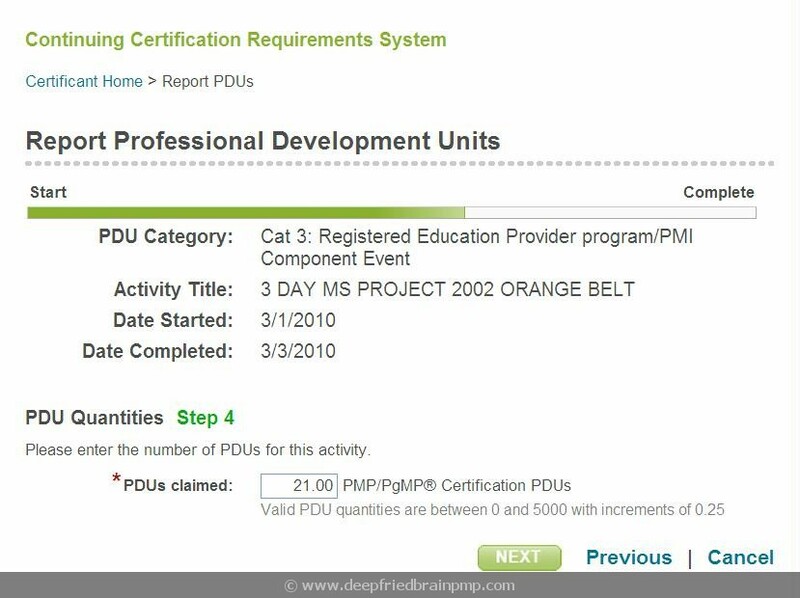 If you haven’t yet figured out where these PDUs will come from, I suggest that you read How to get my 60 PDUs for PMP Certification Renewal. 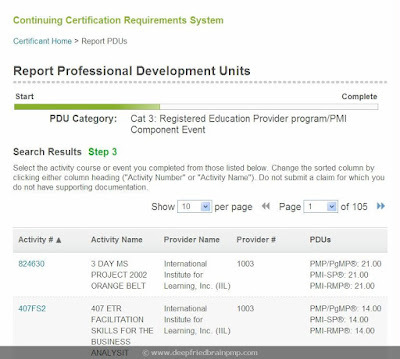 Even though PMI requires us (certified PMPs) to report PDUs at the end of the certification cycle (3 years), it’s in our best interest to report the PDUs as we earn them. PDUs are logged (or reported) into PMI’s Continuing Certification Requirements System (CCRS). 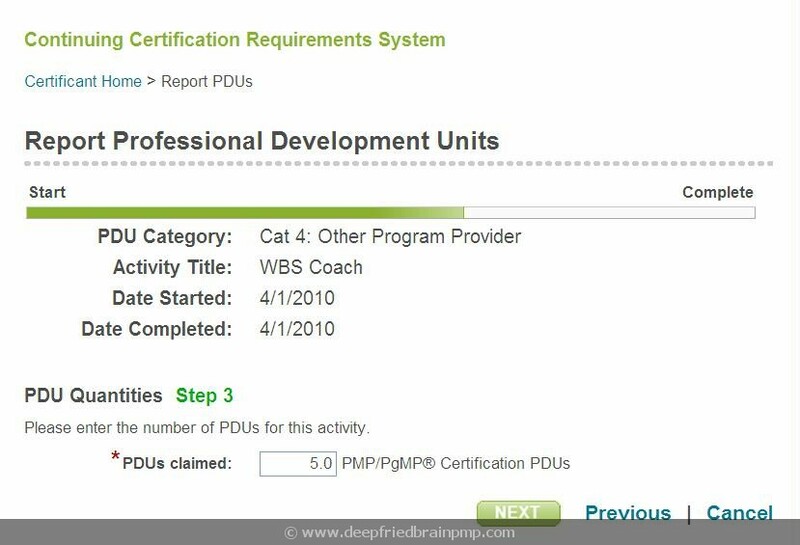 In this article, I’m going to walk you through the process of reporting PDUs to PMI, with step-by-step instructions. 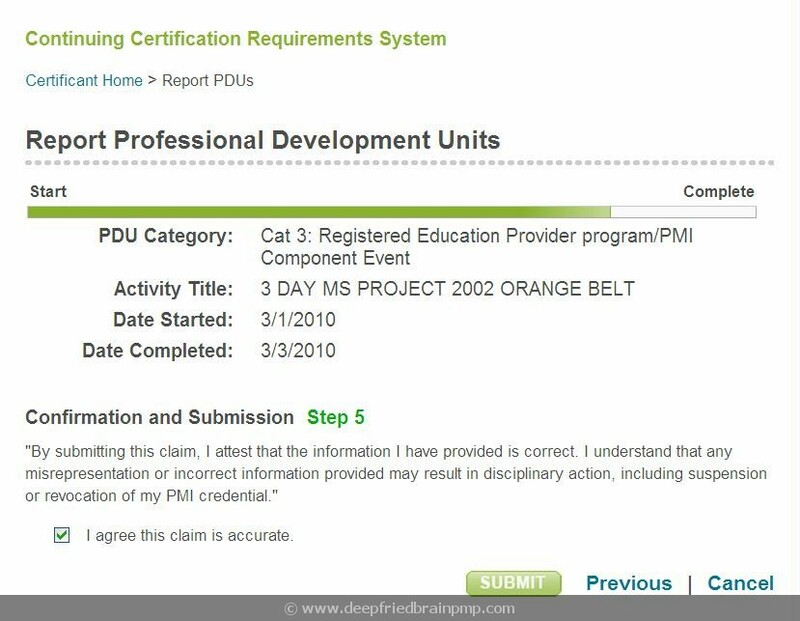 Note: The same process is also applicable to Program Management Professional (PgMP) certification renewal. 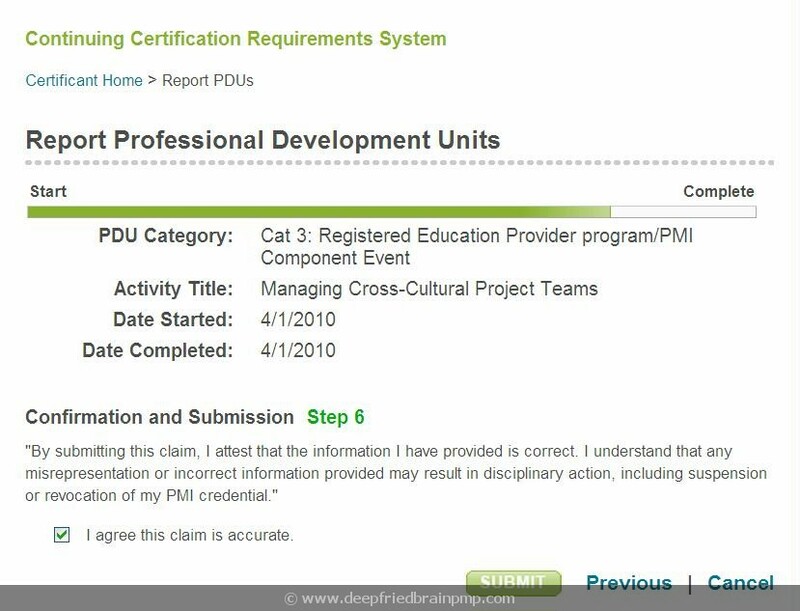 Go to PMI CCRS website and click on "Log In". Enter your login details and click on "Log in". Note: You do NOT need to be a PMI member to report PDUs to PMI. 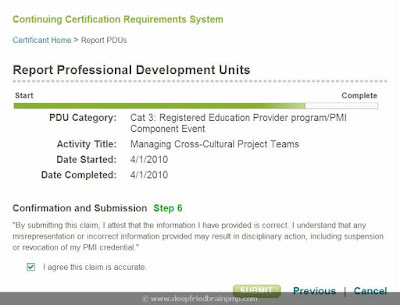 The same PMI account, which you must have created to apply for PMP certification, can be used on the CCRS website. If you cannot remember the Username or Password, click on "Click here for more information" link for help. 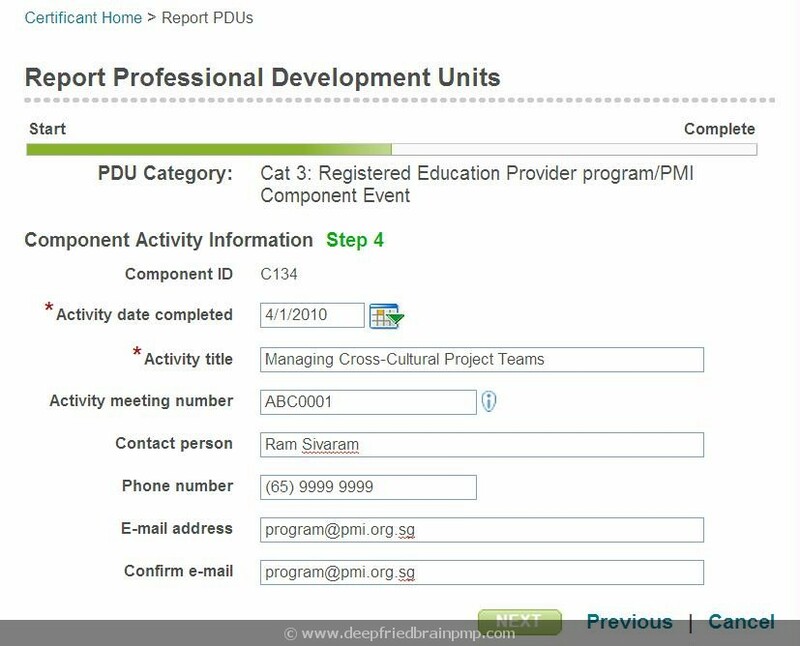 On the PDU reporting page, we need to select the PDU Category. I'll show 2 examples - Category 3 and Category 4 - here. 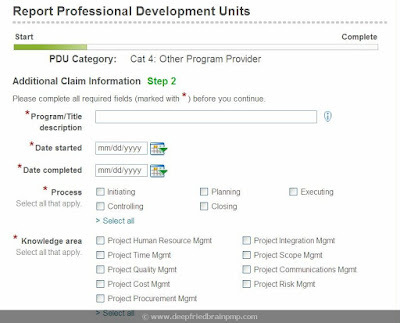 The steps to claim PDUs for other categories are quite similar to those for these two categories. 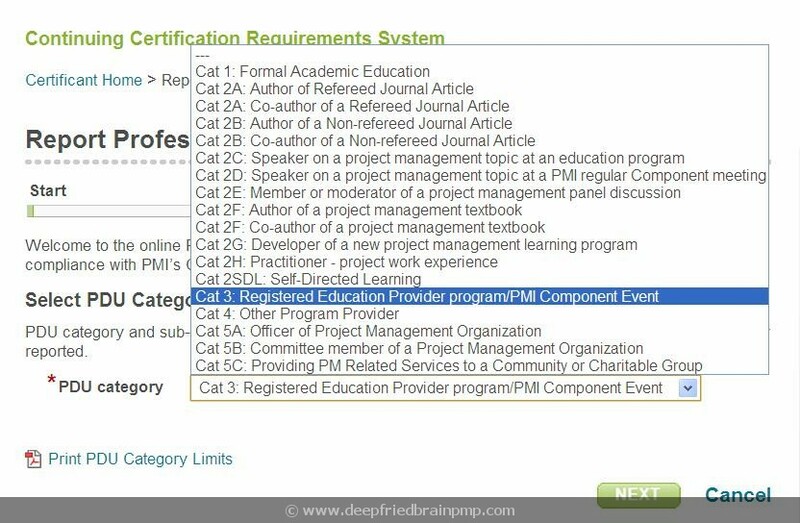 Category 3: Click on the drop down list and select "Cat 3: Registered Education Provider program/PMI Component Event". The screen will refresh to show the "Activity Type" field drop-down. It has 2 options. I'll go through both the options. 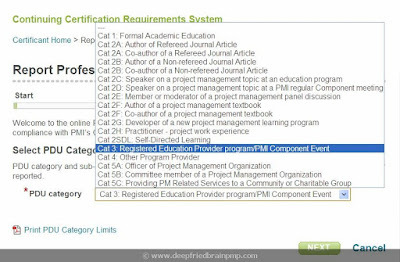 Find an Activity (Course or Event): This option is for courses or events conducted by PMI REPs. It may include classroom courses, online courses, and all those free (or otherwise) webinars. 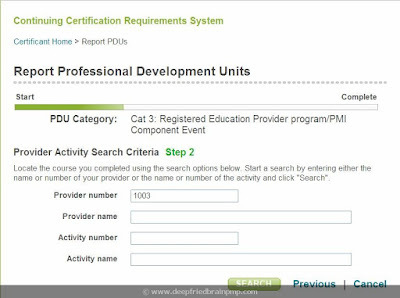 Note that there's no maximum limit to the number of PDUs for courses or events in this category. Step 1: Select this option and click "NEXT". 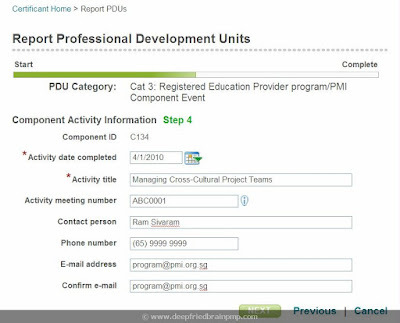 Step 2: At this step, we can search the activities by Provider number, Provider name, Activity number, or Activity name. I'm going to search by Provider number. 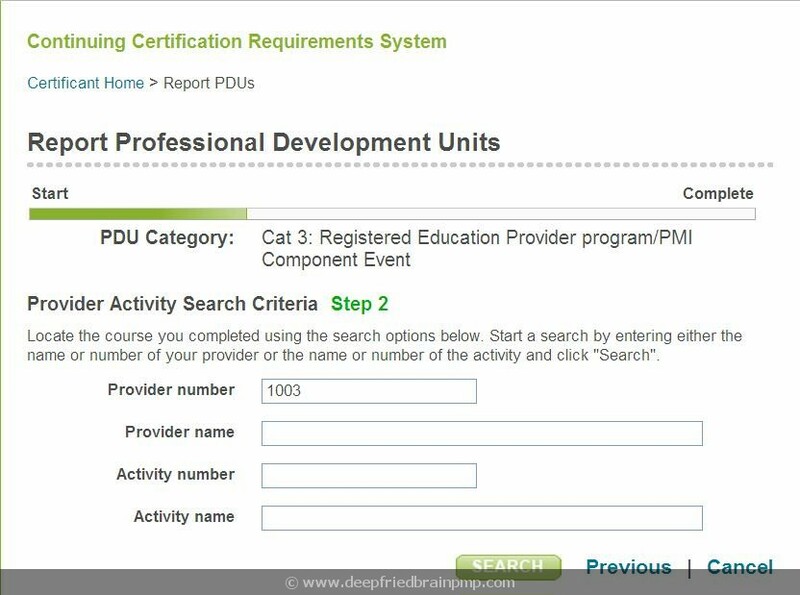 Enter "1003", which is the number for International Institute for Learning (IIL), in the Provider number field, and click "SEARCH". Step 3: The list of all courses and events offered by IIL are shown. 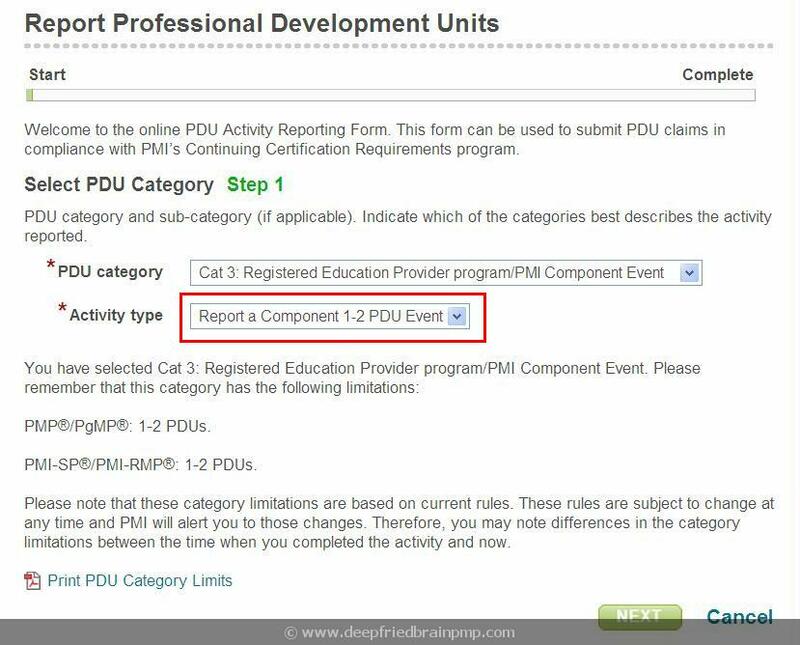 Select on the "Activity #" of the activity that you want to report PDUs for. 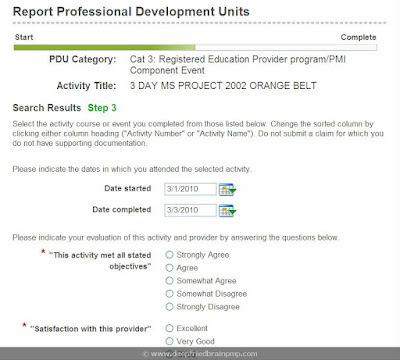 Let's click on the first activity in the list (824630: 3 DAY MS PROJECT 2002 ORANGE BELT), as an example. Click "NEXT". 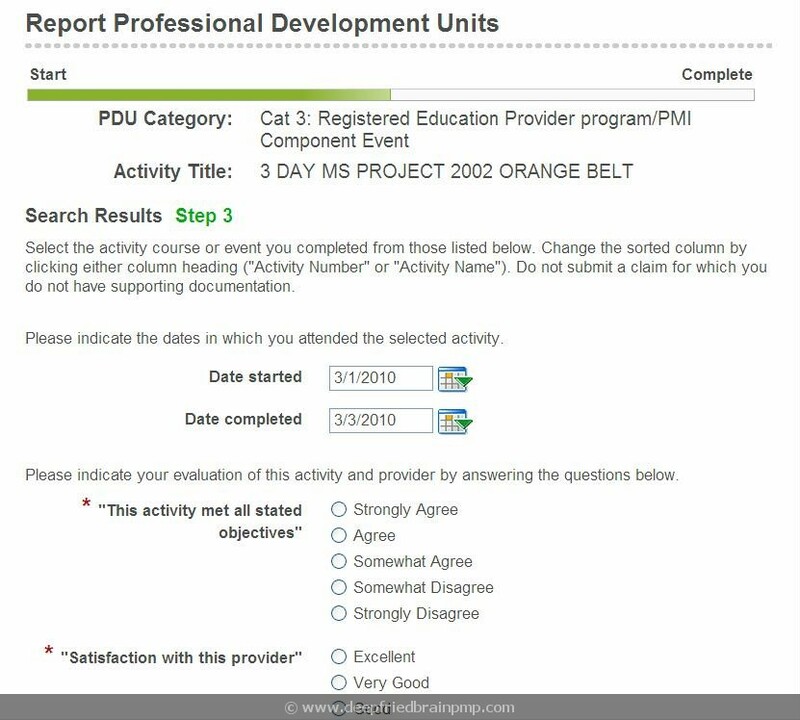 Step 3 (continued): On this page we need to enter the activity details such as date started, date completed, and your feedback on the course or event. Enter the required details and click "NEXT". 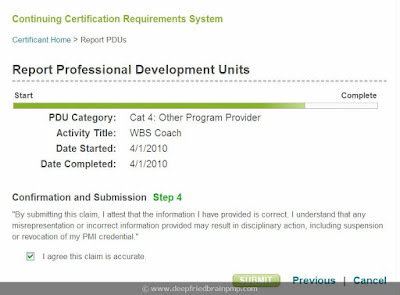 Step 4: Enter the number of PDUs that you want to claim, and click "NEXT". 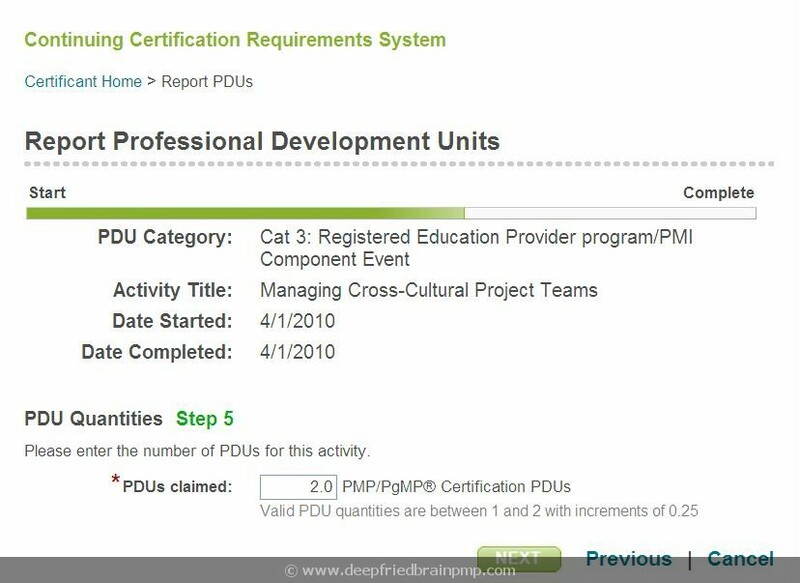 The default number of PDUs for the activity is automatically filled in, but it can be changed. Step 5: Confirm the claim details, check the "I agree ..." box, and click "SUBMIT" to complete your claim. 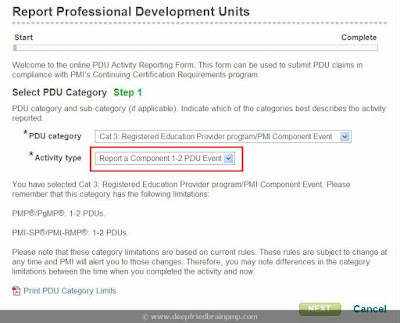 Report a Component 1-2 PDU Event: This option is for 1 or 2 PDU events conducted by PMI Component Chapters. 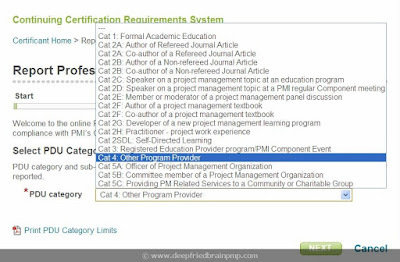 Note that there is a limit of 2 PDUs for events in this category. Step 1: Let's select this option and click "NEXT". 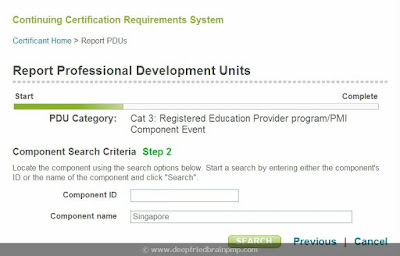 Step 2: At this step, you can search for components by PMI Component ID or Component name. Let's enter "Singapore" in the Component name field and click "SEARCH". 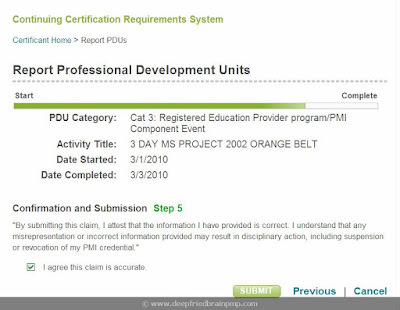 Step 3: All component chapters matching the search criteria are returned. 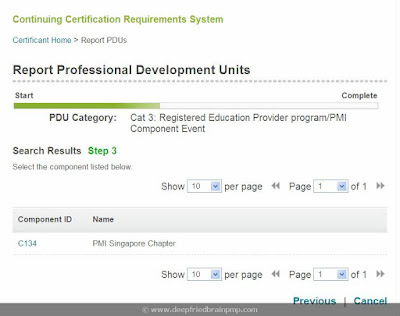 In our case, only "PMI Singapore Chapter" matches the criteria and is returned. Click on its ID "C134". Step 4: Enter the activity details and click "NEXT". These details are usually provided at the end of the event. 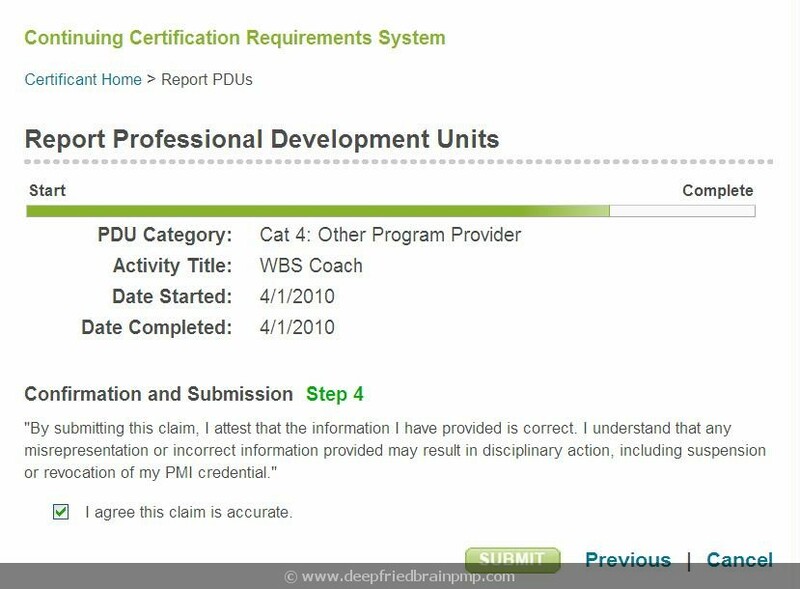 Step 5: Enter the number of PDUs that you want to claim, and click "NEXT". Step 6: Confirm the claim details, check the "I agree ..." box, and click "SUBMIT" to complete your claim. Category 4: Let's review the steps for Cat 4 now. 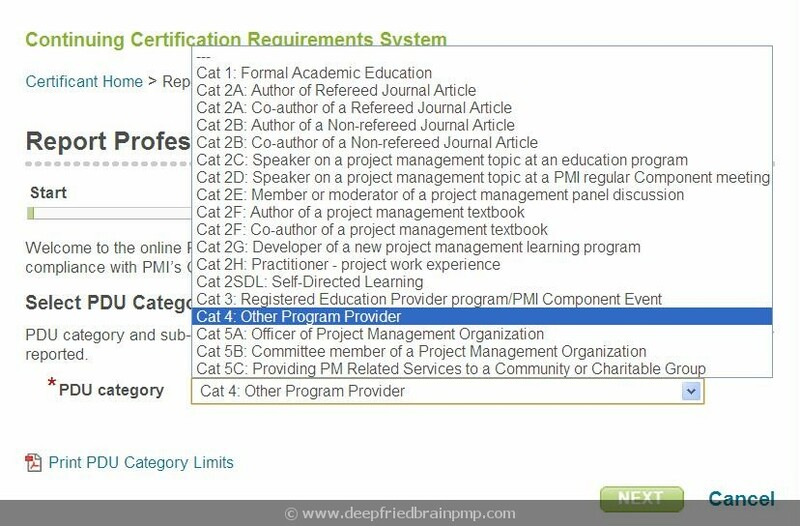 Step 1: Click on the drop down list, select "Cat 4: Other Program Provider" and click "NEXT". Step 2: Enter the activity details on this page. In the top part, enter the Program Title/description, Date started and Date completed. 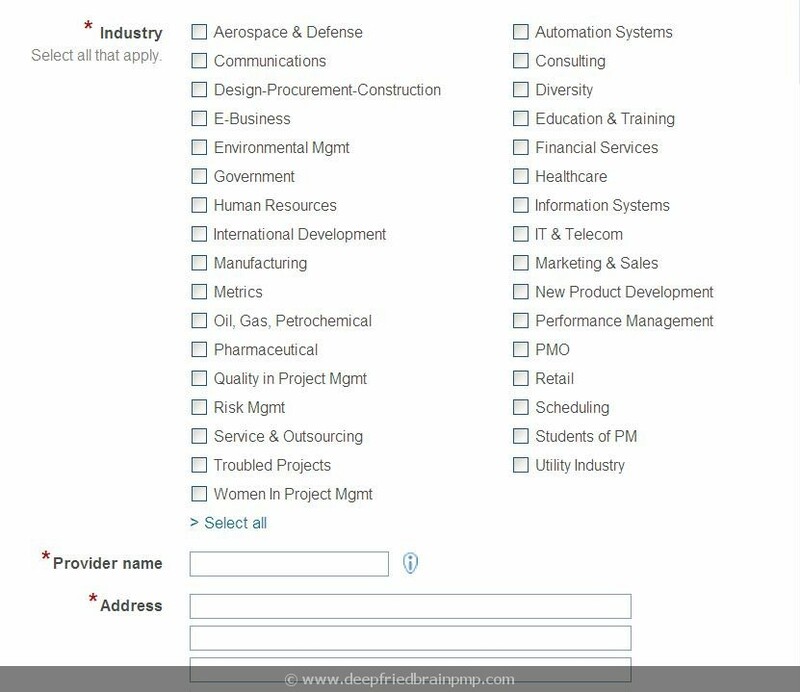 In the middle part, enter the Process Groups, Knowledge areas and Industries covered by the activity. In the lower part, enter the provider details. 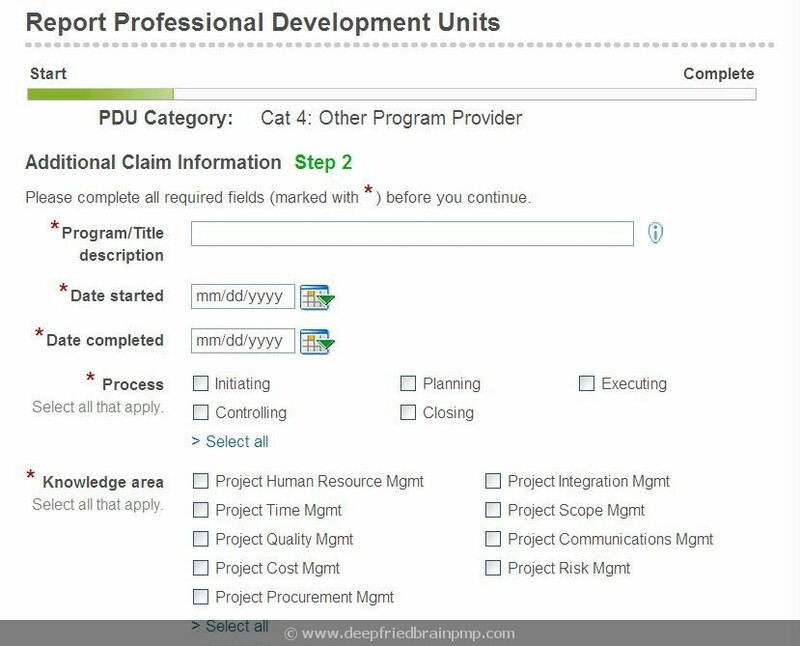 Step 3: Enter the number of PDUs that you want to claim, and click "NEXT". Step 4: Confirm the claim details, check the "I agree ..." box, and click "SUBMIT" to complete your claim. Finally you'll see a confirmation page, which would complete the process. Always report your PDUs in a timely manner. 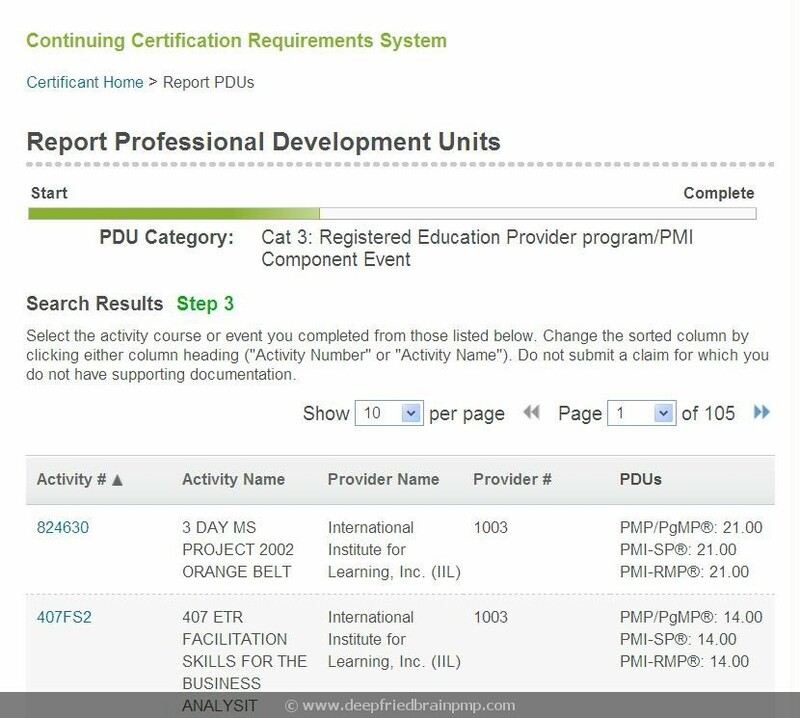 Keep a record of all the activities and PDU certificates, because PMI can select any application for audit, at the time of renewal. Needless to say though, be honest in reporting your activities. Hope you found the article useful. Questions, comments?